I found a great way to conserve water, the dual flush conversion kit! Here at my house, we are pretty good at conserving water. We don't let the water run, we fix leaks promptly and we don't spill oils or chemicals to contaminate our water supply. However, we are always looking f or new ways to save water, our most precious resource. I am going to install a dual flush conversion kit in my toilet. The really cool thing about a dual flush kit is this; you can decide how much water you wish to use each time you flush. This is important, right now we use the same amount of water whether we are flushing some liquid or something solid. But with a dual flush, we have control. We can limit the amount of water we send down the drain! This is so totally exciting! I have a private sewer, I have to maintain it, and being able to limit the water that goes into it sounds great to me. 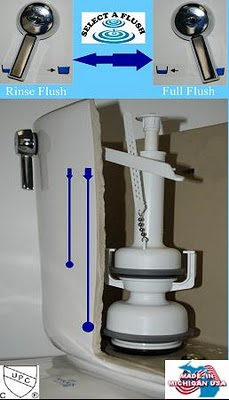 I can install a dual flush conversion kit in my toilet for a fraction of the cost of a new dual flush toilet. I don' t need to buy a low-flow toilet either. The dual flush conversion kit will retro fit my standard toilet into one that saves water. I know this is kind of a funky subject, but it is an important one. I want to be certain I've done everything I can to keep my water clean, safe and plentiful for a long time to come. A dual flush toilet is part of my plan! Excellent idea! Some folks just stick a brick or two in the toilet they have to make it use less water, but sometimes that leaves them without the capacity to actually flush. Gross! This sounds like a great gadget. I'm telling my husband about it.